Posted by admin in Fuji, Japan, Saturday volcano art, volcano art, volcano culture, volcano images. Utagawa Hiroshige (1797-1858), whose given name was Andō Tokutarō, was one of the masters of Japanese painting and print-making in the nineteenth century, one of the last great ukiyo-e artists and a leading exponent of the art of the full-colour landscape print. The son of a minor Shogunal official, he showed early promise in drawing and painting, and studied under a number of leading artists associated with the Utagawa school of the ukiyo-e genre, from which he took his professional name. In the first part of his career he produced prints in the characteristic ukiyo-e genre depicting beautiful women and actors, book illustrations and decorative works. In the 1830s he seems to have become aware of the possibilities offered by the then neglected genre of landscape, perhaps being inspired by the works being published by Katsushika Hokusai, including the celebrated Thirty-six Views of Mount Fuji (1830-33). Hiroshige began producing his own landscape print series, and with the publication from 1833 of Fifty-three Stages on the Tokaido he achieved success and his reputation was assured. The beautifully symmetrical cone of Mount Fuji has long been a profoundly important symbol in Japanese culture, and images of Fuji form an ancient and rich tradition in Japanese visual art. With the development of Edo as the Shogunal capital after 1603 the ascetic religious cult of Mount Fuji became metropolitanized and absorbed into Court culture. During the seventeenth and eighteenth centuries Fuji was also highly active, making it even more of a powerful presence in the local landscape. The volcano, with its pilgrimage routes, its ascetic holy men and its shrines, became the focus of an increasingly popular urban religious movement during the Edo period, providing a market for visual representations of the volcano in prints, books and devotional images which an entire industry of artists, printmakers and publishers sought to fulfil. When first Hokusai and then Hiroshige (and their followers and imitators) began to produce innovative new styles of landscape prints in the first decades of the nineteenth century, Fuji was a natural choice of subject. Hiroshige produced two woodblock print series of Fuji, both entitled Thirty-six Views of Mount Fuji, one in 1852 and another, at the very end of his life, in 1858 (although he produced many more images of the volcano throughout his career). The picture reproduced above is from the latter series and is typical of the artist’s later work in its simplicity, with the composition reduced to a limited number of motifs, and striking use of colour. Here the grey cone of the volcano stands starkly against a sky filled with a dramatic combination of yellow and black. The setting is a famous scenic location on Suruga Bay, on the Pacific coast of Honshu south-west of Tokyo, long celebrated for its views of Mount Fuji. 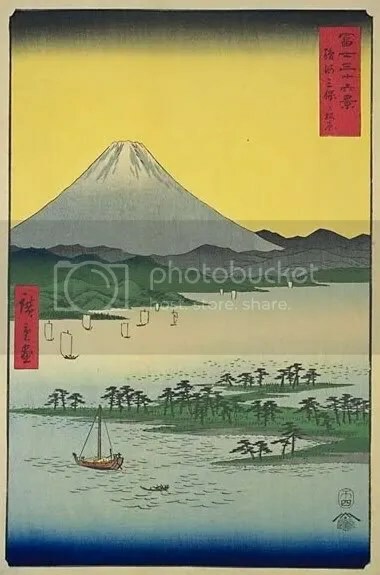 Hiroshige emphasizes the dominance of Mount Fuji, but draws the surrounding scene of land and water, and the evidence of human activity in the boats that pass along the coast, into an overall harmony. This print represents the classic image of Fuji as the central motif of a landscape of elemental clarity and harmonious balance.